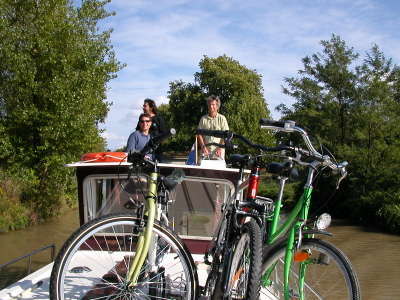 We have been looking forward to this day for a long time, because this is the day when we are to begin our barge trip on the Canal du Midi. We were not able to take possession of our barge until the late afternoon, so after spending the morning strolling around the picturesque city of Sète, we decided to continue our sightseeing with a visit to the city of Béziers, the birth place of the engineer responsible for the construction of the Canal du Midi, Pierre-Paul Riquet. 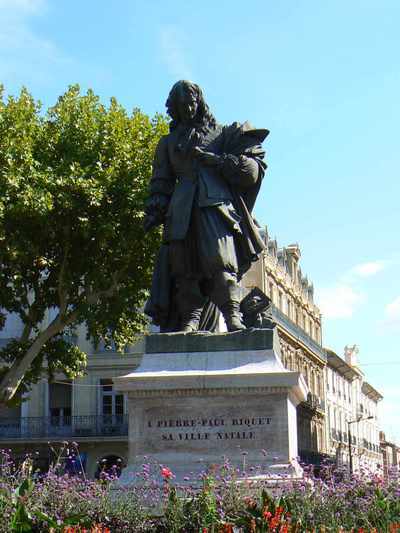 Although the idea of connecting the Atlantic to the Mediterranean was not a new concept at the time, nobody was able to accomplish this astonishing feat until Riquet, who was commissioned by Louis XIV in the year 1666, dedicated his life and his personal fortune to the endeavor. Riquet was not able to survive the strain that the colossal project put on his health, and died just months before the 14-year project was completed, with his son replacing him at the helm. 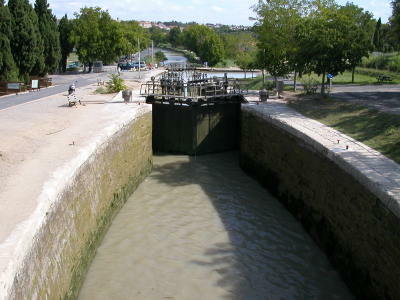 The 9 Locks of Fonserane, which lie just on the outskirts of Béziers, are one of the most remarkable accomplishments of the construction of the Canal du Midi. The series of oval-shaped locks allows a descent of over 21 meters in a distance of just over 300 meters. Pierre-Paul Riquet’s unique oval design, used throughout the canal, and overall attention to detail has ensured the longevity of the locks and the Canal du Midi, which has outlasted more modern designs. 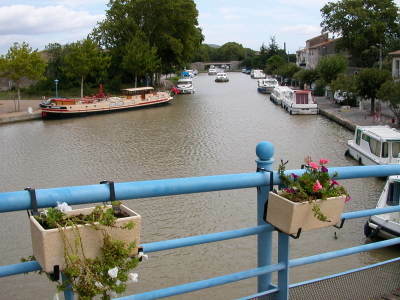 At this point of our trip, we have not yet decided if we will head the barge in this direction, through these 9 Locks of Fonserane toward Béziers, from our starting point in Argens-Minervois, or if we will head in the opposite direction toward Carcassonne. In either case, I think this barge trip could be quite interesting. Our next stop of the day was to do our shopping for the barge trip, and the small supermarket in Homps was the closest to our starting point in Argens-Minervois, so we drove over to pick up some staples and some items for our first meal on the barge tonight !! Luckily, the colorful village of Homps is also where our friends, Diana and Allan Colby (also known as AC/DC) will be spending a couple of nights starting tomorrow, so we can check things out for our highly anticipated rendezvous. We finally made it !! We got to Argens-Minervois to pick up our very French pénichette (named Laurens) from Locaboat, where we reserved it on January 6, 2006. What we had actually wanted was the 1020 FB, with two bedrooms and two bathrooms and a flying bridge. However, we were too late in reserving it, and the only thing that would work for us that was available was the 1106 FB Classic, with two bedrooms, one bathroom, and a flying bridge. The moral of the story is to reserve at least a year ahead, rather than just nine months ahead. After about five minutes of instructions, we were sent out onto the canal for a test drive with a French Locaboat instructor. He showed us a few maneuvers, such as sticking the bow of the barge into the bank of the canal in order to make a 180-degree turn, which worked really well. We later read in our barge book that this maneuver is not really politically correct because it can cause damage to the banks of the canal. Dave passed the barge piloting test with only one bit of advice from the instructor: SLOW DOWN !!! We still had a couple of hours of barging before the locks closed down at 7:00pm, so we headed out as far as we could go. We decided to aim for Carcassonne as our main destination, so we pointed Laurens (the pénichette) west and made it through a couple of double sets of locks before having to tie up along the banks of the canal, just short of Homps. After a bicycle trip into Homps to check things out and to pick up some more items for dinner, we started the evening festivities with a Happy Hour of saucisson de taureau (bull sausage) and very spicy luque olives, washed down with a local Corbières wine. That was followed by a dinner of pasta with broccoli, onions, red pepper flakes, and merguez sausage simmered in cream and accompanied by another local Minervois wine.